b. Found mostly in the Overtown area of Miami and in the Charles Avenue area of Coconut Grove, this vernacular architecture was typically the work of shipbuilders-turned-carpenters from the Bahamas and Key West. These "conch" houses feature a one-and-one-half or two-story rectangular mass, with broad gabled or low, hipped roofs. They are usually of balloon frame construction, rather than the original cross-braced system of heavy timbers based on shipbuilding techniques. Buildings are raised off the ground on wood posts or masonry piers, allowing air circulation underneath the house. 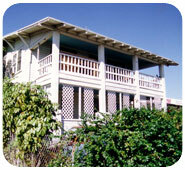 Exterior surfaces are of horizontal weatherboards and windows are double-hung sash type. The most prominent feature of these buildings is the balustraded front porch, sometimes wrapping around the sides on both stories.